Burlingham Seagull C37C new – C41C ??/?? Gore’s Coaches was the trading name of the Southport & Birkdale Motor and Carriage Co. Ltd. of Southport. I was quite taken aback to come across this late survivor of the Royal Tiger/Burlingham Seagull marque in such fine fettle outside Liverpool Lime Street Railway Station, whilst on an enthusiasts’ visit to Birkenhead and Wallasey on 13th June 1971. This one deserved to have survived into preservation – I wonder what became of it ? Super picture and beautiful vehicle – doesn’t look twenty years old, more like twenty months. Very nice, John! Thanks for posting. Reading Corporation (I see you don’t list any from that fleet yet, Peter) had assorted single deckers, even into the RE era, with the Burlingham trademark on the front. Flattery gets you everywhere! Any Burlingham will do for me – apart from the hideous flying pig (c1959) on Bedford/Ford chassis! It would be a hard job to make one of these look bad, but no doubt some of todays ‘Corporate Image Experts’ would have a good try. Yes Ronnie, but imagine one in National white – that would be bad enough! Thank you, Alan, but Roger’s views (good as they are) don’t appear in the column to the left, so a newcomer to the site may not know there are any of this operator without a closer study. I’ve found a few to submit for consideration and will fire them off to our Editor in the course of the next few weeks. Very true, David, the National all white reminded me of the factory finish commercial vehicles were delivered in prior to painting. It’s not so much all one colour that’s the problem, choice of colour could make all the difference on what were very similar vehicles. Take a Plaxton body for example, National all white? drab and anonymous, Glenton on the other hand were quietly restrained and dignified. PSVC gives this coach as withdrawn by Gore’s in 11/72, with no further owner recorded. Evidently reseated to C41C at some time prior to this photo, but recorded as C37C, as given above, when new. I am not a bus or coach driver, just a casual visitor to this site, but it occurred to me that there is a serious front overhang on the coach above. Did it not make it difficult to drive? I once drove a 3 ton truck on a one off 20 mile trip. That gave me the sensation of being slightly drunk. I would have thought that you would have felt completely plastered, driving the above! I don’t know how accurate the listing is. It says 1958 Bedford SB8 Classic Vintage Coach yet further down it says it has a Leyland 350 engine. Did they put Leyland engines in the Bedford chassis? They did fit Leyland engines, John, but I doubt the Leyland 0.350 is original. I don’t think the SB13 (with 0.350) was available in 1958 – more likely an SB8 (with 0.330). The 0.350 was probably a retrofit. 1958 was actually very close to the end of SBO and introduction of SB5 and SB8. I’m not expert enough in this part of Bedford’s history to be sure of dates – I only know the specifications. The SBG morphed into the classic SB3 (300 Bedford petrol), the SBO became the SB5 (330 Bedford diesel) and the SB8 (0.330 Leyland diesel) was an addition to the range. I believe the SB13 (0.350 Leyland diesel) eventually replaced the SB8 but everything was outlasted by the SB5 which continued (albeit with a new, indecipherable code) until the bitter end in 1985. Yes, Bedford SB8 and SB13 models had Leyland engines. Forgot to mention the rare SB1 with 300 Bedford diesel engine. The Bedford dealer, Arlington, had begun offering conversions of the ‘Big Bedford’ S-type goods chassis with the Leyland O350 (5.76 litre) engine from as early as 1952. Bedford themselves began to offer a Perkins R6 (5.56 litre) diesel option in both that model and the SBO coach chassis from 1953. In 1957 Bedford introduced their own 330 (4.92 litre) diesel engine to replace the troublesome R6, resulting in the SB1. At the same time they began to offer the Leyland O350 officially as an option, resulting in the SB8. In 1961 they replaced their own 300 diesel with the increased capacity 330 (5.42 litres), resulting in the SB5. By 1962 Leyland had replaced the O350 and its larger bore equivalent the O375 (not used by Bedford) with the revised O370 (6.05 litre) and O400 (6.54 litre) units respectively. The O370 went into the SB as the SB13, and the O400 into the twin-steer VAL, and later the VAM as well as various goods models. ….. and of course Leyland then produced their own version of the SB13 – the Albion Victor VT41L, with the O.370. Those who ran them held them in high regard but, like many models, they were a little late on the market and only lasted about three seasons before the VAM/R192 style lightweights took over from the traditional SB style motor for independents. I have just come across the messages sent four years ago concerning Bedford coaches fitted with a Leyland engine & I would just like to vouch how good that combination was. When Bedford deleted the option to specify a Leyland power unit in 1967/8 ie the Leyland O400 in the four wheeler VAM14 & "Chinese Six" VAL14 in favour of their own 466 engine to me it was a retrogressive step. The Bedford 466 engine was original developed for the introduction of the KM lorry in 1966. The 466 was not a bad engine, but not a patch on a Leyland unit especially VALs. With this disservice by Bedfords a good number of coach firms move onto the Leyland (& indeed Perkins) powered Bristol LH & its longer brother, the LHL. Andrew. I think most people – and certainly most operators – agree that the VAL14 and VAM14, because of their 0.400 engines, were better than the VAL70 and VAM70, with the Bedford 466. The Ford R series began to catch up with Bedfords and, possibly overtake them (literally) from this time on. Bedford’s heyday was really from the OB through to the SB3. Yes I agree with you David, as the Ford R series really gave Bedford a run for their money especially with the turbo engine & six speed gearbox on Fords. In the later years of Glenway Coaches, Fords served the company well,drivers only complaints were the turbo would cut out for no reason & a sloppy gearbox (having to fish for gears). Fords would fly along on the flat on the motorway, get to a gradient & then old AEC Reliances would fly past in the middle lane leaving the modern Ford standing. 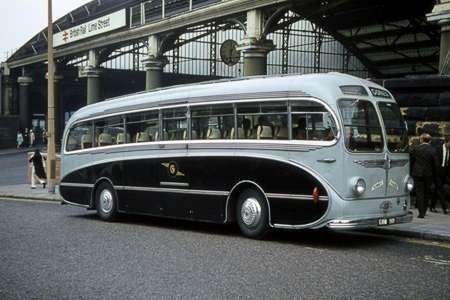 Going back to the original thread of Leyland Royal Tigers (bit before my time), the only one I recall was a 1952 model that had been rebodied in the mid 60s with a Plaxton Panorama body, my friend drove that one, he liked it apart from heavy steering & not too good brakes.